When it comes to getting a new forklift, there are plenty of options available. These include buying new, renting (long and short term), leasing or buying used equipment. Only you and the key stakeholders in your business, which includes forklift drivers, can determine which is the best way to secure your equipment needs. Often, especially if your utilisation is relatively low, a used forklift can be the ideal outcome. How do you know if you’re buying a good truck? Here’s some tips to assist you. Sounds obvious doesn’t it? Like a car, you should drive the forklift to ensure all functions work properly. Start by turning the forklift on. Easy starting engines are a great sign. Make sure you check the brake functions during your test drive. Also, Check the safety features are functional, the seat belt is working and all lights are operational. It’s also important to ensure the load rating is sufficient for the products/loads you intend to shift and the mast will lift to the appropriate height. 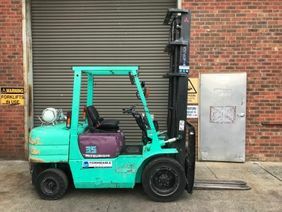 Make sure the mast collapsed height is suitable for your facility and remember to see what attachment options are available to make the most productive use of your forklift. Buy a reputable brand. Don’t buy low volume, imported gear from marginal manufacturers. Chances are these won’t be supported easily. Stick to known brands and preferably models that are still in production. The ideal situation is to view service records for your forklift. If these are not available, look to see when the forklift was last serviced and by who. Also, raise the bonnet and look for signs of recent servicing. We recommend paying a little extra money for warranty. Like a car, due diligence during the purchase process will ensure you buy value for money.